The Croome & West Warwickshire Hunt are a friendly hunt and like to welcome newcomers. so to help you we have produced the information below as a guide. There is no need to regard hunting as old fashioned because in fact most of the traditions, etiquette and behaviour associated with hunting are practical and exist for very good reason, such as to show a mark of respect to the landowners who’s land the hunt crosses and to show appreciation for the work that hunt officials have put in to planning for the day. When planning your first day, please get in touch with the Hunt Secretary to find out which meets are suitable for newcomers. Town Meets, such as Christmas Eve and Boxing day may not be suitable due to the confined space and mix of general public and horses. and make yourself known to them. Remember: We all had a "First Time" and if in doubt Ask. Officially our year begins on May 1st which is the date upon which new staff or Masters begin their duties but it is easier to follow the pattern of the year if we begin when hunting begins which, for us, is when the harvest allows (normally the beginning of September). In this very early part of the season meets are held early in the morning before the temperature rises and evaporates the scent. Meets are held at least twice each week, most are shortly after sun-rise and are part of the process of preparing horses, hounds and the country for the coming season. The Dress code for Autumn Hunting is called ‘Ratcatcher’ (see Terminology & Hunting Phrases for a brief description). The ‘formal season’ starts on the first Saturday in November with “The Opening Meet”. This is one of the highlights of the year when supporters gather to enjoy the hospitality of our host. It’s a time to catch up with old friends and make new ones. The Masters Are in overall command of the hunting activities. They decide when and where hounds will meet, what coverts are to be drawn, and when hounds will go home. They are responsible for hounds showing the best possible sport under existing conditions; and are responsible for the hounds, the staff, and making sure the riders only go where they are permitted neither causing damage nor annoying the landowners who make the sport possible. In this hunt, there are six joint masters, each dealing with a different section of the country (the area we hunt over). The Huntsman Controls the hounds, indicating to them by his horn or voice when he wishes them to follow a trail or flush to the bird of prey. He attempts to be sure that hounds work together as a pack by encouraging the tail hounds and steadying the lead hounds. In the case of a check he must be prepared to assist hounds to recover the line by use of a cast if necessary. His technical decisions must be quickly made, and staff and Field must abide by them. The Whippers-in Assist the Huntsman in controlling hounds by turning them back to the Huntsman or by encouraging them forward to him as necessary. Whippers-in are also used by the Huntsman to retrieve the hounds should they engage a hare or deer. No one except the Huntsman gives orders to Whippers-In. No one, except by request of the Huntsman or master, should accompany them or attempt to assist them. The Field Consists of the mounted followers and is controlled by the Field Master who rides at the head of it. The Field Master is responsible for and leading and controlling the Field across the country in pursuit of hounds. Whilst also seeing that the Field does not interfere with hounds in their work; and he is also responsible for seeing that the Field avoids damage to the landowners’ property. The Field should follow the Field Master and follow his instructions. The Secretary Deals with the hunt’s administration. Check the meet card for where and when the hunt is meeting. If you are not a subscriber, please ring the secretary and ask if you may join the hunt for the day. Newcomers should check that the meet is suitable for them and she will advise you where to park. Ensure your horse and it's tack are clean and well turned out. Gloves are optional but should be light in colour (e.g. white or cream) black jacket after opening meet, and dark in colour with Ratcatcher during Autumn Hunting. Long hair should be kept tidy with a hairnet. Aim to arrive at least ten minutes before the time of the meet and be mounted at the meet by the time stated on the meet card. Park sensibly in the designated area ensuring you aren't blocking a lane or driveway or anything that may cause congestion or inconvenience to other road users. On arrival at the meet introduce yourself to the Master(s). Seek out the person responsible for collecting caps (secretary, who usually wears a green armband). Please do not leave it to them to seek you out. Hunting is a sport to enjoy. The more people you talk to at the meet, the happier the atmosphere that is created and the quicker you will make friends. Make sure to face your horse to the hounds should you be in close proximity of them. Do not allow your horse to tread upon or kick a hound. A horse will by instinct kick out at something that comes up unexpectedly from behind. This rule applies throughout the hunt. At the end of the meet, the Master will address the followers thanking the hosts and giving out the arrangements for the day. At the meet it is announced who will be “Field Master” for the day, if it is not the speaker. Then the Huntsman blows his horn to gather hounds and they set off to begin the day. Do remember to keep your horse facing the hounds at the meet, as well as when moving off. If your horse is a novice a Green ribbon should be worn at the top of the horses tail. 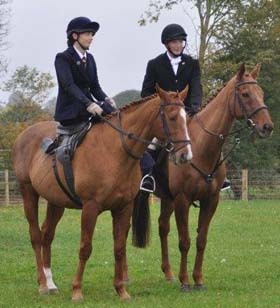 No one should bring out hunting a horse which kicks, but if a horse has been known to kick out if other horses come too close behind it, a red ribbon should be worn at the top of it's tail. If hounds come towards you, face your horse to them. Ensure you stay behind the Field Master and do not get in the way of the huntsman or whippers in. Pass on any messages when they come, loud and clear – such as “gate-please” or “keep in please” for example. Shutting Gates - It is the duty of all hunt followers to ensure that all gates that have been opened are closed. Please thank any person who opens the gate and do not ride off and leave a mounted follower to try and shut a gate on their own. Generally practice good manners – they go a long way and cost nothing. Make sure you thank everyone that does something to make your day more enjoyable such as opening a gate. When jumping, wait your turn. If your horse refuses then let the others go first before trying again. If it stops three times, don’t carry on trying, you will just make a mess and risk injury. If you should damage a fence, gate or any other of the landowners property, ensure you leave it stock proof and report it to the master or secretary as soon as practicable. If you forget or can’t find someone, it could result in livestock getting out on to the road, so a phone-call to one of the hunt officials to inform them will be gratefully received. At the end of the day (or when you decide to finish), be sure to thank the Masters and say “Goodnight”. Upsetting farmers and landowners – be most courteous to them and remember that they enable our sport to take place and so treat them with utmost respect. You probably won’t know these people, so it is good policy to greet and thank everyone you meet as you cross land. They do in fact get very upset if they are ignored. Taking the direct route straight across a field and / or causing distress to livestock. Always ride around the perimeter. Cutting through fields to get home or back to the lorry without prior permission. Even if you crossed the land when you were with ‘The Field’, the landowner gave permission for the hunt to cross, not individual followers on their way home. Also bear in mind that the land owner may have given time constraints to the hunt officials after which the hunt is not allowed. Green Ribbon Worn on the tail of a young horse – give it some space. Hand in the air by gateway Signal to people coming towards a gate, but out of hearing, that the gate should be shut. The response to which should be to hold your hand in the air to show you have got the message and will shut the gate. Red Ribbon Worn on the tale of a known kicker. These horses should be kept at the back of the field until they become educated and no longer need to wear a ribbon. (usually by Field Master) This means stand still where you are, not wait until you get level with the Field Master and then stop. Hunt Buttons When you first start hunting, the buttons on your hunting coat should be plain. Subscribers who, over a period of time, have gained knowledge and been helpful to the hunt may be awarded with the hunts button to go on their hunting coat. Along with the buttons, the Croome & West Warwickshire also have a green collar, which was inherited from the West Warwickshire when they amalgamated with the Croome Hunt in 1973-74. Our buttons are stamped with the initials of the Croome Hunt and the crest of the Coventry family who founded the Croome Hunt. Masters four and Hunt Staff have five. Hat Ribbons Hunt Caps and most Riding hats have ribbons on the back, the ends of these ribbons hang down when they are bought. Only Masters, Hunt Officials and Hunt Staff should have their ribbon-ends hanging down, so members of the field should sow their ribbons up, or remove them. This is to help members of the field tell if they are following a Master, Hunt Official or Hunt Staff. Following hounds by car is an art, calling for extreme patience, with almost a sixth sense if you are to be in the right spot at the right time. Here is some advice to get you off to a good start. The most important thing to remember when following by car is to be discrete and hear without being heard. Switch off your engine as soon as you stop. Foot followers depend so much on hearing, that a running car can be a great nuisance to other followers. Exhaust fumes will also mask scent. Park on one side of the road only. Assist Hunt Officials by opening and closing gates for them. Do not obstruct mounted Hunt staff and followers. Avoid parking on mown grass verges, and if you find you have by mistake, be extra careful not to wheel-spin when you move off. Avoid causing an obstruction to other road users, parking in gateways, driveways or junctions. Do not leave public highways and drive on private land or tracks unless express permission is given. "Car Please" Is shouted to tell the Field to keep to the left to let cars through on the road. Cast When the hounds are looking for the line. The huntsman may cast the hounds towards where he thinks the hounds will pick it up. Check When the hounds lose the line. Feather Hounds are said to feather or be feathering when they have the line but are unable to speak to it. Field Master The person in charge of leading and controlling the Field. "Gate Please" Shouted backwards on going through a gate which should be closed. Gate shutter A person specially designated to shut gates and mend fences. Sometimes wears a white armband. "Good Morning" The appropriate greeting at the meet. "Good Night" The appropriate salutation for the end of the day even if it was an Autumn Hunting morning which ended before midday. "Hold Hard" Shouted by the Field Master to stop the field. Huntsman The man who hunts the hounds. There is only one huntsman on the hunting field per day, he may also be a Master, and he has right of way at all times. Hunt A hunting day usually consists several hunts, each hunt varying in length, sometimes incorrectly referred to as "runs" or "lines". Hunt Button & Collar Subscribers who, over a period of time, have gained knowledge and been helpful to the hunt may be awarded the hunt button and collars of the hunt. Hunting the clean boot The process of hunting human runners with no artificial scent applied. “Keep in Please” A signal given to members of the field when riders must keep in to the verge or off the crop. Line The scent left by the trail. "Loose Horse" Shouted when someone has fallen off and the horse is running away. Master Maybe a Joint Master. These are the people responsible for the running of the hunt. They should have right of way at all times second only to the hunt staff. "Master / Huntsman / Whip / Hound please" This means give way to these people as they have a job to do. If it is heard on a road or a track everyone should get to one side, not line both sides, to reduce the chances of them being kicked. "Master / Huntsman / Whip / Hound on the right / left" This means the Master/Whip/Hound should be let through on the side shouted. The side corresponding to the direction of travel of the majority of the Field. Opening Meet The start of formal hunting. Puppy A hound which is new to hunting that season. It will appear fully grown. Rat Catcher Term used to describe the official dress for mounted followers during Autumn Hunting and consists of a Tweed jacket as opposed to a black jacket. Rat Catcher is also an acceptable form of dress after the Opening Meet, but it won’t keep out the cold and wet in the winter. Riot or rioting When hounds hunt something other than that which they are supposed to be hunting, they are rioting. In the case of bloodhounds hunting the clean boot / Trail hunting, all wildlife is known as riot. Scent The smell, indiscernible to the human nose, left by the runners. The hounds also use the smell of the disturbed ground where the runners have been to stay on the line. Speak or speaking Hounds do not bark, they speak or are speaking when they are "on the line" (hunting a scent). Walk Hounds at walk, often known as Puppy Walking, is where whelps are sent to private homes, in minimums of two's, from the age of eight weeks until they get too big and boisterous for the walkers, at which point they return to kennels to learn how to fit in to the pack. "Ware Hole / Wire / Glass" Ware is often pronounced "War" and means beware. Therefore if you hear "War Hole", or "Ware Hole" it actually means mind out there is a hole in the ground coming up! Similarly any other hazard. Whelp A new born hound is a whelp and remains so until it come back from walk. Whipper-in The person who helps the huntsman control the hounds. This person has right of way at all times and will only give way to the Huntsman.